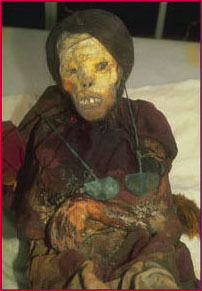 A version of this piece first appeared on NOVA's Web site in September 1996 as part of Ice Mummies of the Inca. Not to put too fine a point on it, a mummy is an old dead body. But unlike a skeleton or a fossil, a mummy still retains some of the soft tissue it had when it was alive—most often skin, but sometimes organs and muscles, as well. This tissue preservation can happen by accident or through human intervention but, in either case, it occurs when bacteria and fungi are unable to grow on a corpse and cause it to decay. Historically, quick drying has been the most common method of mummification, since bacteria and fungi cannot grow where there is no water. 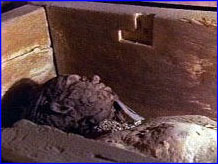 Mummies can be dried in the sun, with fire or smoke, or with chemicals. Since most bacteria and fungi cannot live in sub-freezing temperatures, permanent freezing can also produce a mummy. 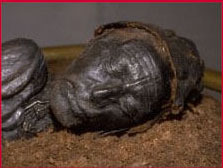 Placing a body in an oxygen-free environment, such as a peat bog, will also cause mummification, because microorganisms can't live without air. 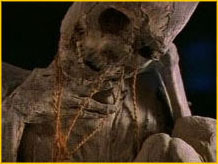 Yet another way to create a mummy is to bury it in soil containing chemicals that kill bacteria and fungi. Some of the world's best known mummies were created accidentally, when a body's final resting place happened to prevent the natural process of decay. But many cultures around the world have sought to mummify their dead on purpose. The process of artificially preserving a dead body is called "embalming," and the methods used are as varied as the cultures themselves. Ancient Egyptians are perhaps the best known mummy-makers—though initially, it was their climate, not their skill, that preserved their dead. Arid desert winds and blazing hot sand could dry corpses out quickly enough to mummify them. In fact, the oldest-known Egyptian mummy, dated around 3500 BC, is believed to have been created this way. The first "artificial" Egyptian mummies were made around 3000 BC. These early efforts at embalming were crude, but reflected the culture's emerging beliefs about preserving the dead to achieve eternal life. Initially, mummification was so expensive that it was a privilege enjoyed only by the Pharaoh and a few favorites. Everybody else was given a simple grave burial in one of the vast cemeteries or "necropolises" of the time. But the promise of eternal life was so alluring, that it wasn't long before wealthy Egyptians began signing up for mummification, too. By 1550 BC, every Egyptian who could afford it was mummified. Embalming became an art—practiced in booths set up along the banks of the Nile river. A top notch embalming job took seventy days. The first forty of these were spent drying out the corpse. The process began with the removal of the lungs, stomach, liver and intestines through an abdominal incision on the left side of the body. The brain was removed through the nose with an implement called a brain hook, which looked something like a crochet needle. The heart, believed to be the source of thought, was left inside the body. After the organs were removed, the body was rinsed with wine, which helped kill any remaining bacteria. It was then covered and packed with a form of natural salt called natron and left to dry on the embalming table. Forty days later, it would be blackened and shriveled, but ready for restoration. 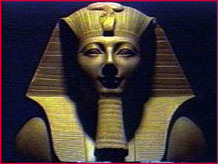 The ancient Egyptians believed that a person's Ka (vital force) and Ba (personality) left the body at the time of death. But they also believed that Ka and Ba could be lured back if an idealized re-creation of the body was offered. This re-unification of body and spirit was the ticket to the nether world. To make sure the spirit could find the body (which by now looked like a withered prune) a restorative beautification process was necessary. The skin of the corpse was massaged to make it supple, the body was stuffed and perfumed, and padding was slipped under the skin to approximate plump flesh. Finally, rouge and other paints were applied. The last step was to coat the mummy in warm resin and wrap it from head to foot in layer after layer of linen strips. About 150 yards—the length of one and a half football fields—were used. Egyptians stopped making mummies between the fourth and seventh century AD, when many Egyptians became Christians. But it's estimated that, over a 3000-year period, more than 70 million mummies were made in Egypt. While the ancient Egyptians may be the best-known mummy makers, they were not the first. A very sophisticated fishing tribe called the Chinchoros, who lived on the north coast of what is now Chile, were embalming their dead as early as 5000 BC. Chinchoros embalmers disassembled their corpses, chemically treated the internal organs to prevent decay, and then reassembled the pieces. They often added wood supports along the spinal column, arms and legs, filled in the body cavity with fiber or feathers, and coated the exterior of the body with clay on which they painted or sculpted. Infants, children and adults of both sexes were mummified, though some corpses undoubtedly received more attention than others. Further north, another coastal group at Paloma were mummifying their dead as early as 4000 BC. The Palomans used salt to stop decay and carefully positioned their dead with knees drawn to the chest and hands clasped. The bodies were then wrapped in reed matting and buried under the floor of their existing homes. 5000 years later, during the time of the Inca (approximately 1100 to 1500 AD), the Andean tradition of preserving the dead was still intact. Most Inca mummies were arranged in the familiar fetal position and were wrapped in leather or cloth or placed in baskets or sat under huge ceramic jars. These "mummy bundles," often brightly decorated, were buried with food, clothing and other items. 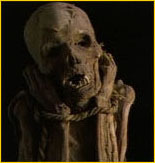 Some archaeologists believe that the Inca mummified all their dead, not just the elite. When the Spanish conquered the Inca in the 1500's and 1600's, they forbade the practice of mummification, declaring it pagan. The Spanish destroyed countless Incan burial sites—partly for religious reasons, but also to plunder the gold often buried with mummies. As a result, few Incan burial sites remain. In 1875, archaeologists did manage to uncover a huge burial site at Ancón on the Peruvian coast. Hundreds of shafts, some 18 to 20 feet deep, led to tombs where extremely well-preserved mummy bundles were found. Apparently, the dry climate and high salt content of the region had helped to prevent decay. The mummies were wrapped in cloth, seaweed, leaves, grass matting and furs. Many bundles were topped with a sort of false head, decorated with eyes that stared out into the darkness of the tomb. Embalming methods usually reflect the tools and materials available to a given culture. 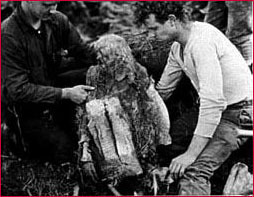 For example, the Aleut people, who lived on the Aleutian Islands off the coast of Alaska, mummified their dead by removing the organs and stuffing the cavity with dry grass. Next they laid the body in a stream, where the running water dissolved the body's fat and washed it away, leaving only muscle and skin. The body was then tied in a squatting position and dried in the open air. Once it was dry, the mummy was wrapped in several layers of waterproof leather and woven clothing and placed in a warm cave, either hanging from the ceiling or lying on a platform to keep it off the damp floor. In one Aleutian cave, archaeologists found more than 50 mummies dating back 250 years. In Papua New Guinea, embalmers smoke-cured the dead, covered them in a protective layer of clay and propped them up on scaffolding that overlooked their villages. It's not known exactly how the Anasazi, who lived in the "four corners" region of the American Southwest, mummified their dead. But mummies dating as far back as 100 AD have been found wrapped in fur and leather blankets inside caves and rock holes. Many of these mummies were found wearing a new pair of sandals, presumably for use in the next life. Some of the most spectacular mummies were created accidentally. In 1991, German climbers found a body frozen on top of a glacier near the Austrian-Italian border. Initially, the police and forensic experts who arrived on the scene didn't realize how old the body was—even though he was wearing a grass cape, carrying a bow and arrows and had shoes stuffed with grass for warmth. Later, radiocarbon dating determined that the "Iceman" died sometime between 3350 and 3300 BC—making him the oldest well-preserved mummy in the world. In 1972, hunters found the best preserved human bodies in North America at an abandoned settlement called Qilakitsoq in Greenland. The "Greenland Mummies," who died about 500 years ago, consisted of a six-month old baby, a four-year old boy, and six women of various ages. Protected by a rock that overhung a shallow cave, the bodies were naturally mummified by the sub-zero temperatures and dry, dehydrating winds. Accompanying the eight bodies were 78 items of clothing, most made out of seal skin. Over the years, peat cutters working the bogs of northwest Europe have uncovered hundreds of mummies. The spongy top layer of a peat bog tends to seal off oxygen from the layers below. A bog's naturally acidic environment also helps to create mummies, giving them a distinctively brown, leathery and lifelike appearance. The oldest "bog mummies" are from the Iron Age (between 400 BC and 400 AD) and are thought to have been the Celtic or Germanic contemporaries of the Romans. Strangely, many of the mummies found in the European bogs show evidence of violent deaths. With slit throats and broken skulls, these individuals may have been victims of ritual sacrifice, just like the mummies of China's Takla Makan Desert. Photos: (4) courtesy The Mountain Institute; (5) courtesy Harold McCracken; (6) courtesy University of Insbruck; (7) courtesy Silkeborg Museum.